WILTSHIRE potter Riley Ellis said he wants “another one” after collecting his first winner’s trophy on the Cuestars Under-21 Silver Tour. The 14-year-old from Clyffe Pypard edged Essex lad Louie Leighton 2-1 in the final of the second leg at Waterlooville Sports Bar. Ellis took the opening frame but rankings leader Leighton, who won the first event in Salisbury last month, came back strongly to force a decider. “I still thought I could do it,” Ellis insisted. “I’ve come back from worse before. Demonstrating strength of character and self-belief, he left his opponent chasing snookers on the colours in the third. 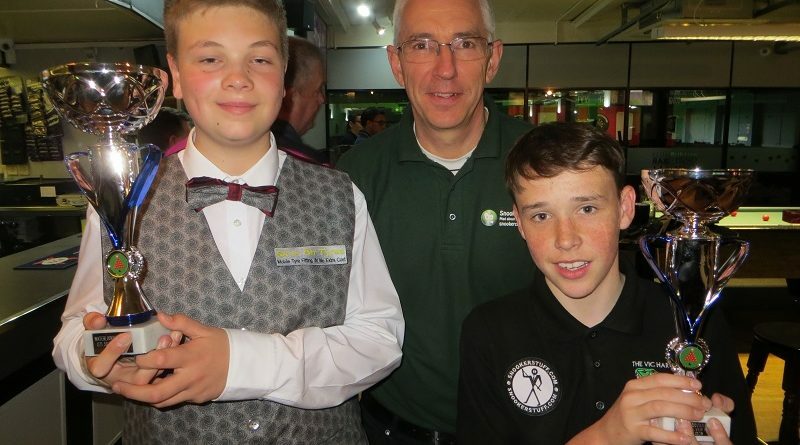 Ellis, who lost three semi-finals last season and was runner-up once, qualified from the group stages as one of the two best third-placed players despite winning three of his four matches in the event sponsored by Waterlooville-based website Snooker Crazy. He then beat home player Samuel Laxton 2-1 and Will Forster 2-0 to reach his second Silver final. Forster (Gosport), who finished third in his group on his debut in Salisbury, won three of his four round-robin matches to qualify in first place and beat Richard Hillgrove (Southend) 2-0 in the last-eight. Ben Crump, another Gosport lad, made his Silver debut and went out 2-1 to O’Shay Scott (Eastleigh) in the quarter-finals. Two new high breaks were recorded on the day. Mason Wilson (Basingstoke) knocked in a 33 against Callum White (Havant). And Scott achieved his target of making a half-century before his tenth birthday. The Angry Wasp knocked in a 56 in a group-stage victory over Ellis. The third leg of ten is at Jesters Snooker Club, Swindon, on Sunday, November 4. Visit www.snookercrazy.com for a wide range of cue, cases and accessories. ROUND-ROBIN GROUP A: 1st, Louie Leighton (Basildon SC); 2nd, Richard Hillgrove (Basildon SC); 3rd, Nat Kidner (Greenbaize, Bournemouth); 4th, Zak Truscott (Waterlooville Sports Bar); 5th, Oliver Cooper (Frames, Coulsdon). ROUND-ROBIN GROUP B: 1st, Samuel Laxton (Waterlooville Sports Bar); 2nd, Ben Crump (Stoke SC, Gosport); 3rd, Mason Wilson (Academy, Basingstoke); 4th, Callum White (Waterlooville Sports Bar); 5th, Keegan Reed (Salisbury SC). ROUND-ROBIN GROUP C: 1st, Will Forster (Mayfair, Gosport); 2nd, O’Shay Scott (Chandlers Ford SC); 3rd, Riley Ellis (147 SC, Swindon); 4th, Dean Russell (Waterlooville Sports Bar); 5th, Harry Wilson (Waterlooville Sports Bar). QUARTER-FINALS (12 points): Leighton 2-0 M Wilson, Scott 2-1 Crump, Ellis 2-1 Laxton, Forster 2-0 Hillgrove. SEMI-FINALS (15 points): Leighton 2-0 Scott, Ellis 2-0 Forster. FINAL (25/18 points): Ellis 2-1 Leighton.